I’ve been taking a break from chess, so you haven’t seen much analysis here recently, but this weekend I did have some friends (Gjon and Cailen) over to my house for some videos and speed chess. We watched one of Jesse Kraai’s recent videos on ChessLecture, called “An Aesthetic Chess Ideal,” from August 6. If you haven’t seen this lecture, you really owe it to yourself to watch it. Even Jesse says that this may be one of his best games ever, and that is saying a lot. It’s not that there are lots of flashy sacrifices. Yes, there are a couple of pawn sacrifices, and a bishop sacrifice that will blow you away because it’s so unusual, but in a way the sacrifices aren’t the point. They just arise naturally out of White’s strategic play. And yet, saying “they arise naturally” also somehow shortchanges the virtuosity of Jesse’s play. They arise naturally on some mystical, philosophical level. They arise naturally if you understand the position the way that Jesse does. If not, you will never be able to find them. We also watched a couple of lectures on chess.com, which made an interesting contrast with Jesse’s lecture. First, I had to watch one of David Pruess’s lectures on the King’s Gambit, because I’m a big fan of that opening. Well, it was okay, but he left out a couple of important lines, and the lecture just didn’t seem as cohesive or as well thought out as Jesse’s. Then we started watching Sam Shankland’s lecture on his victory over Jaan Ehlvest in the Chicago Open. We only got about a minute into it, and then Sam said, “Last time I played him, I crushed him.” Gjon pushed the “pause” button and said, “That’s just wrong.” Here’s a guy (Ehlvest) that used to be one of the top ten players in the world, and Sam just talks about him so dismissively, as if he were some patzer he had crushed at the local club. “He needs to show more respect,” Gjon says. We eventually decided not to listen to the rest of the lecture. Finally we listened to a lecture by Melikset Khachiyan, which was good, but I wouldn’t say it was soul-satisfying in the way that Jesse’s lecture was. Comparing these lectures made me realize that now, more than ever, Jesse Kraai’s lectures are the real reason to subscribe to ChessLecture. If he ever leaves, they should just fold up their tent. You can hear Eugene Perelshteyn both on ChessLecture and on chess.com. 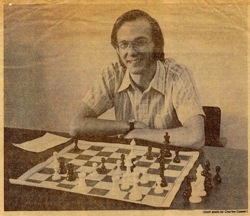 You can hear Dennis Monokroussos both on ChessLecture and on ICC. But you can only hear Jesse on ChessLecture, and there just isn’t anybody else who does this genre better. I think Jesse Kraai’s lectures are pretty good also. But I have found Valeri Lilov’s lectures to be really informative with good suggestions for those of us with rather modest ratings and understanding of chess principles. As one who has watched/listened to his lectures pretty much since he arrived, he has continued to improve on a number of levels. I really like the enthusiasm he brings to his subject, and unlike many of the lectures I have tuned into, I almost always find something practical to take away and apply. Dana, I think you, Jesse and Dennis are by far the best three lecturers on ChessLecture.com. Lilov is okay too… not quite in the same league but that may be partly because English isn’t his first language. I agree with Rob that he is improving a lot and I have listened to quite a few of his lectures and found them enjoyable. I am putting together a DVD for some friends of mine who are beginners. I upgraded my CL membership to Gold so that I can download the videos in MP4 format. There will be a menu system where you can view the videos based on theme (openings, endings, tactics, etc), lecturer, or recommended order (i.e. the order I think they should watch the videos in) I am in the process of going through the clips right now and am focusing exclusively on yours and Jesse’s. I may throw in a few others too but I can safely say the bulk of the clips will be yours and Jesse’s. Speaking of which, when is your next lecture going to be? It’s been a while and I look forward to them. You were regularly posting new lectures once or twice a month but there has only been one since August I think. You are missed! I am a subscriber of both chess.com and CL sites, really like Melik , Dejan Bojkov and Roman on Chess.com , I subscribe CL only for Jesseâ€™s lectures, he is the best , I did enjoy your lectures on Rook Play. I agree with your assessment of CL vs. chess.com. I subscribe to both sites, but I plan to downgrade my chess.com subscription soon. The videos just aren’t as good. That said, I do enjoy IM Danny Rensch’s videos on chess.com. His series on Rook Endgames, IQP Positions, Pawn Structures, and Live Blitz, are all very instructive. If you can get past Rensch’s often obnoxious glibness, he delivers great material with great enthusiasm. You and Jesse and Bryan Smith have the best CL videos. Monokroussos is also good sometimes. One of my all time favorites is “A rook isn’t what it used to be!” Love the game and the presentation. BTW, you might want to follow ChessNetwork (http://www.youtube.com/chessnetwork). It’s a master named Jerry who produces his own chess videos on YouTube. Some of them are pretty instructive, and I enjoy his style of commentary.